First baseman Anthony Rizzo has appeared in 106 games for the Sea Dogs this season hitting .260 and is tied with Nate Spears for the team lead in home runs with 19. Rizzo joined the Sea Dogs from Single-A Salem on May 10th. Combined between Salem and Portland this season, Rizzo leads all Red Sox minor leaguers with 24 home runs and ranks second in RBI with 97. The 21-year old set a franchise record collecting 32 RBI in August. He was selected the Eastern League Player of the Week for the week of August 2nd through August 8th, hitting .444 with three home runs and 12 RBI during that span. Baseball America tabbed Rizzo with "Best Defensive First Baseman" honors in the Eastern League in their annual "Best Tools" survey. The 8th ranked prospect in the organization according to Baseball America was drafted by the Red Sox in the sixth round of the 2005 First-Year Player Draft. The 20-year old was the youngest full season pitcher in the Eastern League in 2010. Kelly started 21 games for the Sea Dogs in his first full season as a pitcher notching a 3-5 record with a 5.31 ERA and 81 strikeouts tossing 95 innings. Kelly earned his first Double-A win on June 5th tossing six shutout innings against the Reading Phillies. The Sarasota, Florida native was the first round pick of the Red Sox in 2008. Baseball America rates Kelly as the top pitching prospect in the organization. He is rated to have the organization's "Best Curveball" "Best Fastball" "Best Changeup" and "Best Control" according to Baseball America. Infielder Ray Chang hit a team best .298 (131-for-440), ranking ninth in the Eastern League with nine home runs and 55 RBI in 116 games. He also leads the team with a .385 on base percentage, ranking third in the league. 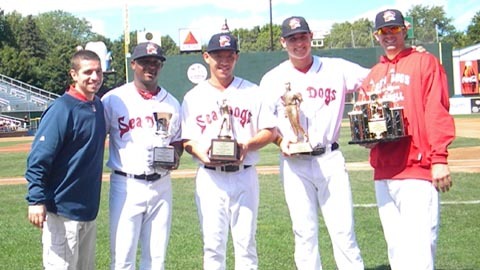 Chang played all four infield positions for the Sea Dogs in 2010, committing only six errors with most of his time being spent at third base appearing in 86 games. The Eastern League selected Chang to the 2010 Eastern League All-Star Team as the Utility Player. Chang also was selected to participate in the 2010 Eastern League All-Star Game in Harrisburg, Pennsylvania. Chang started at shortstop for the Eastern Division squad and was 2-for-4 with a run scored. Baseball America named Chang the "Best Defensive Third Baseman" in the Eastern League in their annual "Best Tools" survey. The Leewood, Kansas resident was signed by the Boston Red Sox as a minor league free agent on January 6, 2010. Jason Rice has excelled on the mound in 2010, posting a 3-2 record with 2.90 ERA and a team-leading 13 saves. The 24-year old was selected to participate in the 2010 Eastern League All-Star Game. Besides his outstanding season on the mound, Rice has dedicated a lot of his time and energy to the Greater Portland community this summer. When he was not striking out batters late in games (71 strikeouts in 57.0 IP), Rice made appearances at schools, summer camps, charity softball games, the Barbara Bush Children's Hospital, and countless other places in southern Maine. He also participated in the annual Sea Dogs Baseball Camp, Bowling with the Sea Dogs, and numerous baseball clinics at Hadlock Field. Rice was a staple at the Sea Dogs' Autograph Table and always had time for a high-five with a young fan. The Red Sox acquired Rice in the Triple-A phase of the 2008 Rule 5 draft from the Chicago White Sox. The Portland Sea Dogs will open the 2011 season on Thursday, April 7th at 6:00 PM at Hadlock Field against the Reading Phillies. Individual tickets for the 2011 season will go on sale at the Hadlock Field Ticket Office at 9:00 AM on Saturday, November 6th. The Sea Dogs will welcome the 7 millionth fan to Hadlock Field sometime during the 2011 season.